This is a bevel edged & polished black ceramic blue & green opal ring with a custom engraving of your choice inside of the ring. 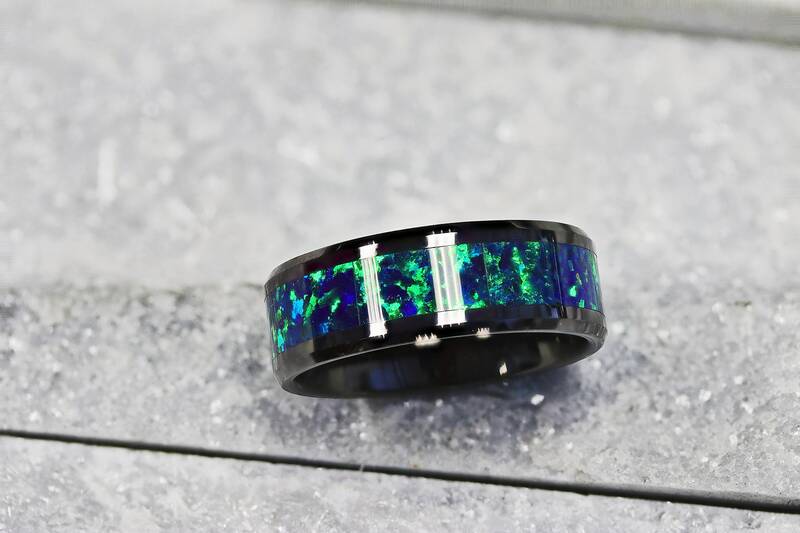 This ring has a beautiful opal that consists of blue and green colors. The blue and green opal shimmers beautifully in the light. Tungsten carbide is extremely scratch resistant, but the inlay is not. All of our rings are not indestructible and can scratch if hit against blunt objects or dropped like all jewelry. All stone inlays have lines of separation in the center. 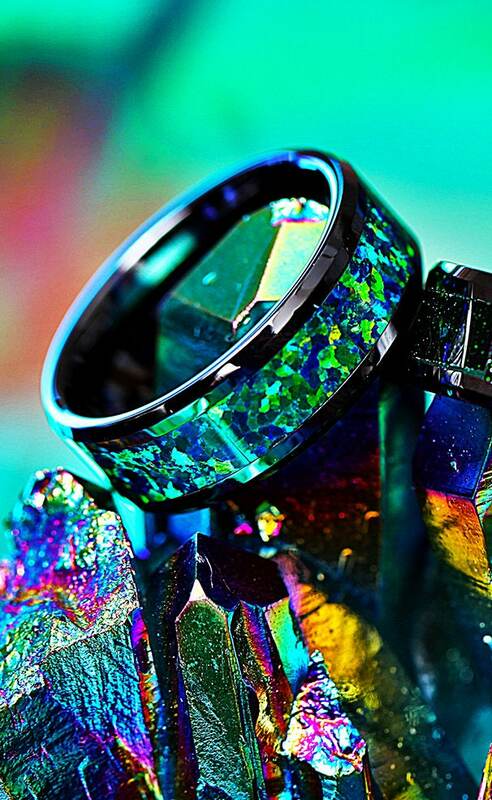 This ring looks beuatiful in the light and changes colors depending on the angle the light hits it. Great customer service as well. Love it! I could not be happier with the quality, look, or feel of this ring. Customer service will get back to you promptly and help you with any concerns you might have. I had to send this ring back to get it resized and it was done promptly without any problems. I can’t recommend this place enough and I will definitely be looking at wedding bands here in the future! They are beautiful rings. Absolutely no issue with them whatsoever and somehow look better in person. The engravings on the inside are perfect and as requested. Thank you so much for the gorgeous rings and fast shipping! It is absolutely perfect and looks better then the picture. Thank you for the fast delivery and excellent customer service. You answered every enquiry I had.